Worksop has its heroes on sea as well as on land. Many of our brave lads are serving their country in the Navy, and some alas, have made the supreme sacrifice. 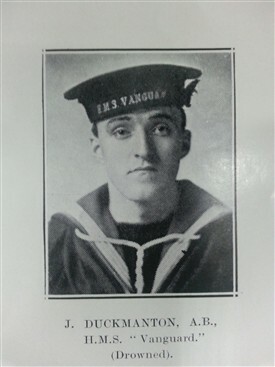 To the latter must now be added the name of John Duckmanton, seaman, of H. M. S. Vanguard. He was one of the victims who went down in the explosion when the ship was lost. Duckmanton would have been 19 years of age next month. He was the eldest son of Mr. and Mrs. John Duckmanton, 41, Anston Avenue, and formally for 24 years on the Osberton Estate. He had been in the Navy 2 ½ years and was in the Jutland Battle, so his career, short as it was, was one of great adventure. He was a fine lad, a credit to his family and himself. Frank, brave and fearless, he was loved by his people and liked by his associates. We are sure that his parents and other relatives have the sympathy of our readers. This page was added by Inspire Librarian on 19/08/2014.